First author’s institution: Institute of Astronomy, University of Cambridge, UK. Status: Accepted for publication in MNRAS. Where do (the most) massive planets come from? The story seems to be clear. The evidence is overwhelming, that most planets originate from agglomerations of small dust particles, also known as the core accretion model. A short version of the story is summarised in this astrobite. Using modern versions of the core accretion scenario, computer simulations manage to form massive planets at large orbital radii beyond 10 AU and more. However, the older theory of the origin of massive planets is called disk fragmentation (or global gravitational instability, there are some confusions of this term with the settling of the dust to the mid-plane of the disk in astrophysical literature, which is why we will stick to disk fragmentation). The idea, which is nicely summarised in this astrobite, is that the initial massive disk undergoes a collapse due to its own gravity and fragments into clumps. A video belonging to the simulations we will talk about later probably helps a lot to clarify what is going on. The problem which is hard to neglect is the fact that disk fragmentation rarely forms planet “clumps” in a realistic mass regime (meaning up to several Jupiter masses at maximum, not tens of Jupiter masses) and usually these clumps tend to migrate inwards extremely fast, such that they will be swallowed by the central star pretty soon. Again, one thing seems to be clear here. If disk fragmentation operates on a level producing planet-like objects within the very first stages of protoplanetary disks, this happens in the outer regime at several tens of AU away from the central star. Only out there the disk is cold enough that the gas can collapse. Therefore, we have two distinct regimes. Planet formation in the inner disk up to ~ 10 AU seems to be clearly dominated by core accretion processes. Disk fragmentation does not operate here because it is too hot because of the intense radiation from the star. Planet formation in the outer disk is harder to explain. Very far out (> 30-40 AU) the disk fragmentation could operate as explained before. However, we are left with a very huge gap in the intermediate range from ~10-30 AU. At this range the disk density is likely too low to feature dust densities high enough for particles sticking to each other – even as recently core accretion modelers found ways to circumvent this problem. For disk fragmentation though, the conditions also do not seem to be proper, as the combination of intermediate temperatures and gas densities does usually not reach the crucial values (remember, we need the disk to be cold and massive). Fragmentation – inside out, or outside in? As computer simulations become more and more sophisticated (btw, read this bite, I seem to link to it every time) physical properties of seemingly simple physical systems change and emergence phenomena appear. In particular, the emphasis of today’s study is on the effect of already induced clumps via fragmentation on the other parts of the disk. This has rarely been done before, as mostly the initial conditions were inappropriate to achieve the correct order of fragmentation. For example, isothermal models (without cooling or heating) tend to artificially enhance fragmentation and hence such disk models produce clumps in the inner parts, which is unrealistic. Figures 1 and 2 show the subsequent evolution of the disk and the formation of two distinct clumps in the disk, which are heavier than ~1 Jupiter mass. Figure 2 (Meru, 2015): (see Figure 1) … triggers the fragmentation of the spiral arm to form a 2nd clump! As the above images show, the presence of a massive clump in the outer part of the disk triggers a clump in the inner part of the disk, at a position where it could not form alone. Normally, this part of the disk does not feature the right conditions, but these get enhanced by the dynamics of the 1st clump. The question is now, whether this is a pure effect of the clump or if the phenomenon also would occur without the 1st clump. As Figure 3 indicates, this is indeed only the effect of the clump and is not due to the general disk dynamics. 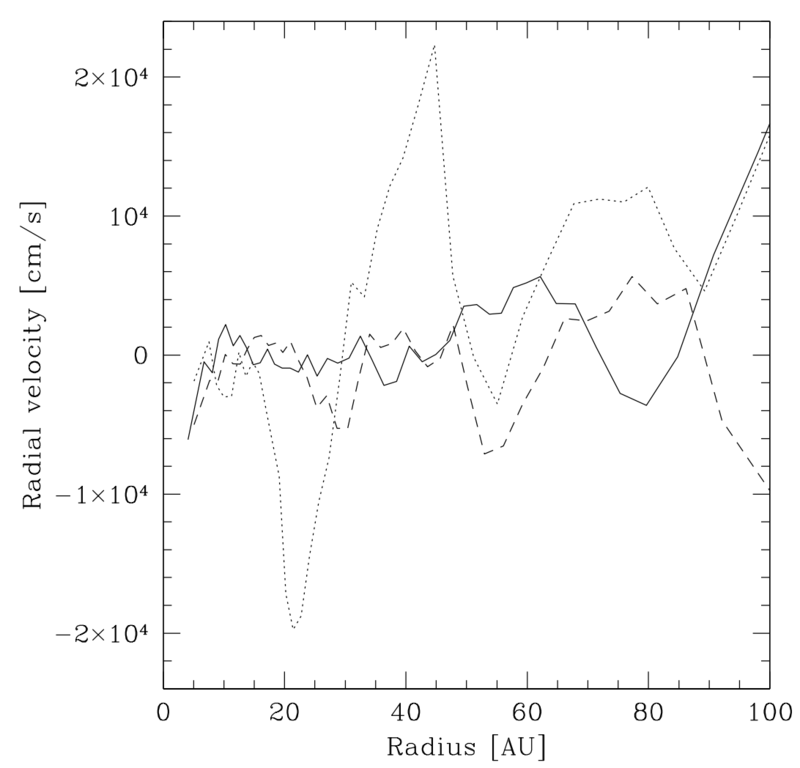 Figure 3 (Meru, 2015): Normalised radial velocity in the disk, shortly before the formation of the 1st (solid line) and 2nd (dotted line) clumps. The dashed line shows the radial velocity for the time of the dotted line, but in a version where there has been no 1st clump at all. This means, the gas just outside of the innermost spiral arm in Figure 1 does not reach high velocities toward the central objects and hence does not trigger fragmentation in there. What does all of this tell me? Firstly, planet formation is a highly complex process and the story is not always as clear as people make us think. Especially, in the intermediate disk regime the community is not clear on how to produce planet-like bodies. Several mechanisms, which work in principle, have been proposed. Fortunately, some day in the not-so-far future we will be able to distinguish which version could possibly dominate the planet formation process in the intermediate disk range, as the outcome from core accretion (aka pebble accretion) and disk fragmentation is wildly different. The first favors planetary objects of the size of Neptune, whereas the latter most often produces planets which are way more massive, up to tens of Jupiter masses. Disclosure: The author of this article was once a member of the research group I am currently working in. However, I was never involved in this study at any point.